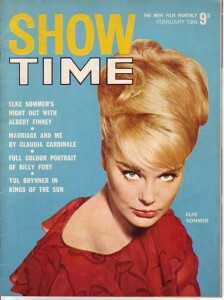 The film magazine Showtime was first published in 1964 as Rank’s competitor to the ABC film Review. Showtime only gave publicity and praise to those films showing in rank cinemas and similar to the ABC film review it contained articles on fashion, pop music and interviews with stars of the day as well as film reviews and advance publicity of films due to be released. The magazine could only be purchased in Rank Cinemas or by subscription.